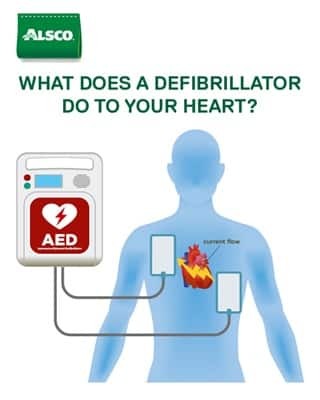 Home » What Does AED Do to a Heart? AED releases electrical shock to the heart. In that way, it restarts the heart. It is important to know that an AED will not revive a heart that doesn’t have any electrical activity left in it. It will simply try to establish regular heart activity in cases when it is disrupted and dangerous. The TV series that show a patient that is flat-lining being rushed into a hospital and doctors reviving them with electrical shock are wrong. It doesn’t happen that way. Once stopped, a heart should be supported by the CPR compressions until medical professionals can take over. They do everything in their power to restart the heart, usually by medications and quick attempt to remove the underlying cause of heart failure. However, it is essential that the First Aid is administered ASAP in case that a person is unconscious and unresponsive. CPR should be started immediately, with the AED to follow. Also, the ambulance should be phoned instantly. For this to happen, your workplace needs to have AEDs at hand. Their location should be known and they should be positioned so that they can be reached within a minute from every place in your company. Every minute counts in the case of emergency. Rent portable AEDs for a monthly fee from Alsco New Zealand and never worry about them again. They will be regularly maintained and checked, and we will even install them ourselves. Do You Use AED on Heart Attack? AED will not help in the case of a heart attack, but you should still use it if you see an unconscious person who is not responsive. 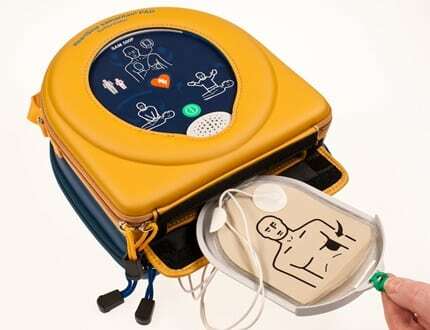 AED is used in a case of a cardiac arrest, but you cannot be sure if you are facing a cardiac arrest or a heart attack just by looking at a person. It would take you several minutes to establish what really happened, and by then it can be too late to do anything about it. While AED will probably not help with the heart attack, it will not do any more harm either. That is why you should perform CPR and use AED just in case. A heart attack or a myocardial infarction is when one or more of the arteries that supply the blood to the heart are blocked for some reason. So, the heart would function properly, but the blood supply is cut off. Since it is rare for the arterial blockage to happen instantly, a heart attack can happen anywhere from a matter of minutes to a matter of hours. However, the heart of the patient will most probably still be beating and they will have a pulse, although the pulse and the heartbeat may be irregular and abnormal. During the heart attack, the electrical function of the heart is not in jeopardy. It is most probably still preserved and that is why the heart is pumping. However, in the later stages of the heart attack, this may stop being the case. What Are the Symptoms of a Cardiac Arrest? Cardiac arrest happens when there is a disturbance in the electrical impulses through the heart. They are what makes the heart contract and, therefore, pump the blood, supplying it to the rest of the body. When these impulses are irregular, a patient is experiencing irregular heartbeats or arrhythmia. Cardiac arrest is fatal within 5 minutes if the person doesn’t get the CPR and the AED shock. Therefore, treat every suspicious state that involved unconsciousness and non-responsiveness as a cardiac arrest. AED should be used as an addition to the CPR. This means that you have already started the CPR and called for help. The CPR and the AED should be continued until the ambulance arrives to take over. When performing the CPR, your pushes are the only thing that keeps the blood flowing and the person alive. If necessary, connect the pads to the AED device if they are not plugged in. Remove the shirt of the patient. Remove all wetness, water or sweat from the person’s chest. They need to be dry. Place the pads on the person’s chest, making sure they are not over a pacemaker or a medical patch. Make sure nobody is touching the patient. Don’t stop the CPR even if the AED reports that it is not needed to shock the patient. If you truly want what is best for your staff, you will have at least somebody who knows how to do CPR and perform First Aid. However, as you can see, there are instances when CPR is not enough. That is why you need to have one or more AEDs so that they are easily accessible from every corner of your workplace. Purchasing them would be a significant setback, but renting your AEDs for a monthly fee can be the perfect answer for your company. It means you can have them in a matter of days and you don’t have to invest too much in them. If you decide to close the company, move it or resize it, you can simply return the AED or rent more or less of them. Rent your AEDs from Alsco New Zealand and make your workplace safe.